I had a dinner a few weeks ago, and it was heavy on the men. My first thought was to make a batch of BBQ’d ribs for all of the guys. 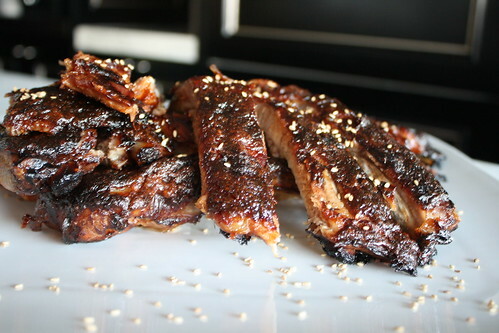 But then I came across an Everyday Food recipe for Chinese Style Pork Spare Ribs. Something new!! I smacked my lips looking at that recipe and trotted right to the grocery store. 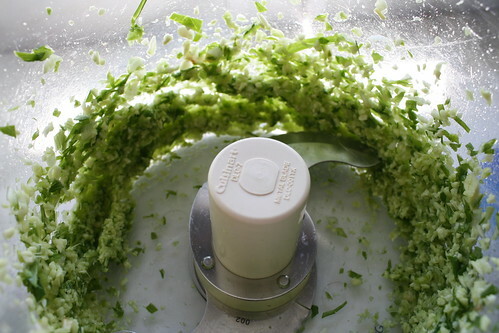 I adapted the recipe and added more flavors and ingredients, but the heart of the recipe is the same. Asian flavors that create a thick marinade and sauce coat the Pork spare ribs. 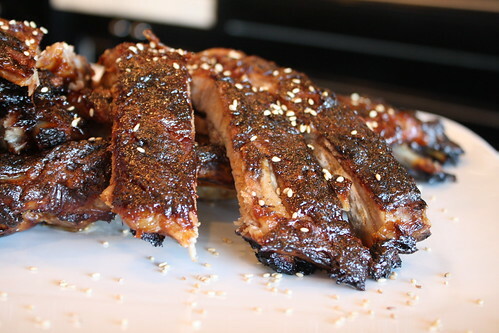 After being slowly cooked in the oven slathered in the Asian BBQ sauce for a couple hours, the spare ribs develop a lovely crispy, caramelized, sticky crust around the pork. Yum. 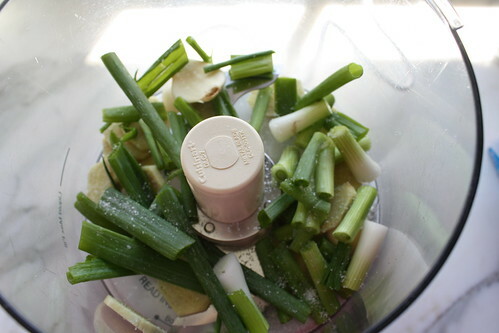 In the bowl of a food processor, pulse together the scallions, ginger and garlic. Add the ketchup, Hoisin, siracha, vinegar, sugar and soy sauce. Pulse everything to combine into a sauce. 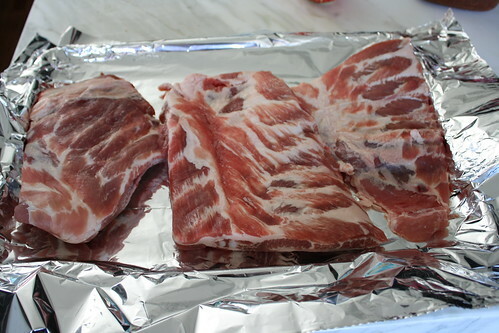 Set the spare ribs on a large sheet pan covered in a sheet of foil. Spread 2/3 of the sauce on the ribs, (both sides). Cover the whole sheet pan in plastic wrap and refrigerate for at least 30 minutes or up to the whole day. While the oven heats up, let the meat come up to room temperature. 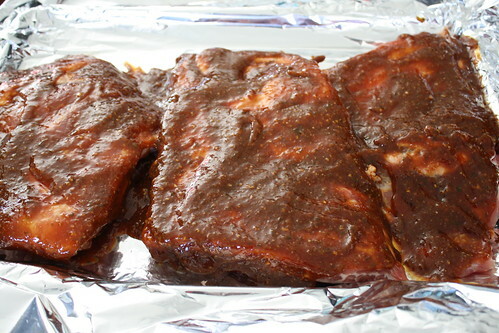 Cook the spare ribs at 325 degrees for about 1.5-2 hours or until the meat easily pulls away from the bone and the sauce is caramelized. 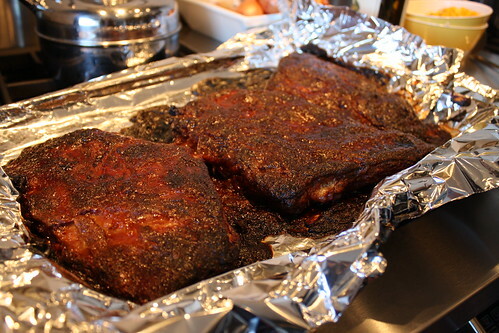 Let the spare ribs rest for a few minutes before cutting into individual ribs and piling on a platter. Sprinkle with sesame seeds. I served the spare ribs with a fresh Asian Slaw and the extra sauce on the side. You got me thinking I need to make BBQ ribs in the oven. Really amazing how they look like they were smoked outdoors. I bet they were yummy! Oh, man do I love sticky, sweet ribs. 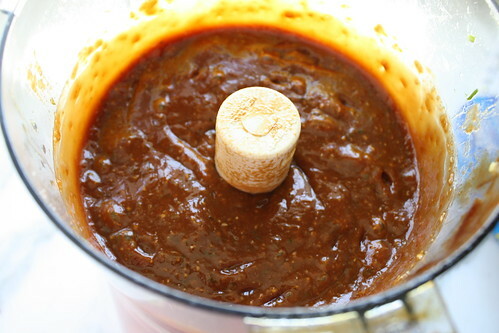 I always use jar BBQ sauce, which I do love. But these, man, I gotta try these. These were always my fav as a kid at the Chinese buffet. Yum! These are making my mouth water. What a gorgeous color on these ribs! Yum, those look like they could melt in your mouth. very good and cool,thank you for your sharing. Excellent sauce. People went crazy for the ribs. I actually finished them off on the grill. Great! so glad to hear that people like them!